NVIDIA officially presents its Tegra 3 "Kal-El" quad-core mobile processor. This new chip promises three times the graphics performance of Tegra 2 as well as a 61 percent lower power consumption. Interestingly, it features four high-performance cores and a fifth low-power core to enable higher energy efficiency. The first product with Tegra 3 will be the ASUS Transformer Prime tablet, this 10.1" device will arrive next month with prices ranging from $499 for the 32GB model and $499 for the 64GB version. NVIDIA today ushered in the era of quad-core mobile computing with the introduction of the NVIDIA(R) Tegra(R) 3 processor, bringing PC-class performance levels, better battery life and improved mobile experiences to tablets and phones. The world's first quad-core tablet with the Tegra 3 processor is the ASUS Eee Pad Transformer Prime. Known previously by the codename "Project Kal-El," the Tegra 3 processor provides up to 3x the graphics performance of Tegra 2, and up to 61 percent lower power consumption. This translates into an industry-leading 12 hours of battery life for HD video playback. The Tegra 3 processor implements a new, patent-pending technology known as Variable Symmetric Multiprocessing (vSMP). vSMP includes a fifth CPU "companion," specifically designed for work requiring little power. The four main cores are specifically designed for work requiring high performance, and generally consume less power than dual-core processors. During tasks that require less power consumption -- like listening to music, playing back video or updating background data -- the Tegra 3 processor completely shuts down its four performance-tuned cores and, instead, uses its companion core. For high-performance tasks -- like web browsing, multitasking and gaming -- the Tegra 3 processor disables the companion. "NVIDIA's fifth core is ingenious," said Nathan Brookwood, Research Fellow at Insight 64. "Tegra 3's vSMP technology extends the battery life of next-generation mobile devices by using less power when they're handling undemanding tasks and then ratcheting up performance when it's really needed." 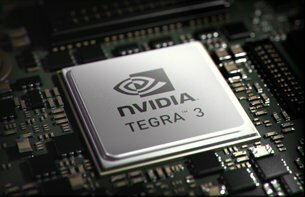 The Tegra 3 quad-core CPUs are complemented with a new 12-core NVIDIA GeForce(R) GPU, which delivers more realism with dynamic lighting, physical effects and high resolution environments, plus support for 3D stereo, giving developers the means to bring the next generation of mobile games to life. For the millions who play games on mobile devices, the Tegra 3 processor provides an experience comparable to that of a game console. It offers full game-controller support, enabling consumers to play games on their tablet or super phone, or connect to big screen HDTVs for a truly immersive experience. It also leverages NVIDIA's award-winning 3D Vision technology and automatically converts OpenGL applications to stereo 3D, so consumers can experience 3D on a big screen 3D TV (via HDMI(TM) 1.4 technology). Fastest, highest-quality gaming - including new Tegra 3 processor-optimized NVIDIA Tegra Zone(TM) app games such as Shadowgun, Riptide GP, Sprinkle, Big Top THD, Bladeslinger, DaVinci THD and Chidori. 40 games are expected to be available by the end of 2011, and over 15 Tegra 3 games are under development for Tegra Zone, NVIDIA's free Android Market app that showcases the best games optimized for the Tegra processor. The Tegra 3 processor is in production. Developers can order the Tegra 3 Developer Kit to create applications for devices with Tegra such as tablets and super phones, at developer.nvidia.com/tegra.